After a well-earned break over Christmas, following Martin Perry’s very successful production of Supper with Scrooge, Red Spider have been hard at work rehearsing and preparing something very different for their next production: J. 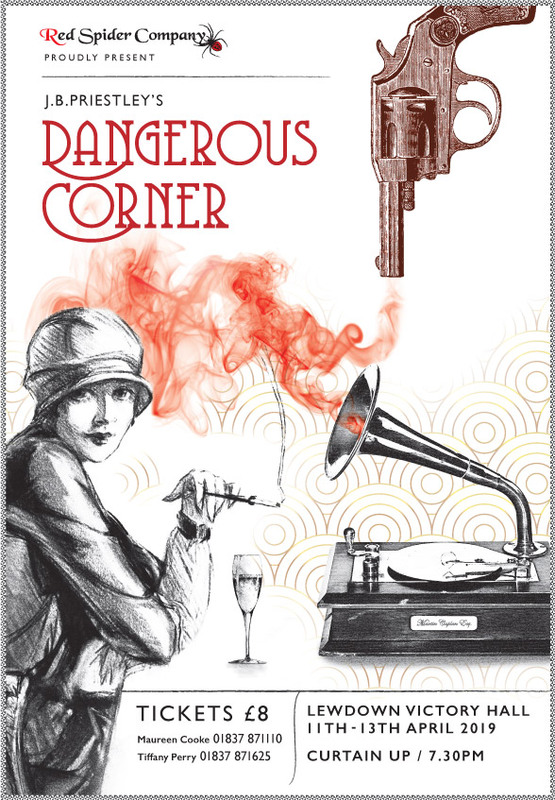 B. Priestley’s first play, Dangerous Corner. Originally performed in 1932, this production will have a distinctly Art Deco feel about it. Certainly times were very different then, not just because the term Brexit had not even been dreamed of, but, more significantly, some four years later the King abdicated because his future wife was a divorcee. Homosexuality was illegal and not spoken of and, of course, one dressed for dinner, while ladies used cigarette holders! Bad language was rare and footballers were not attacked by fans on the pitch. The play is set in the drawing room of the country house of Robert Caplan, head of the family publishing firm, with a coming together of a small group of family and friends. It all begins so innocently, with a musical cigarette box, but conversation leads down a very dark path and family ties are torn apart. There are tears and hysteria, as a dangerous corner in the plot is turned. The question is left hanging: do we need to turn dangerous corners in our lives? You will leave our production with that thought. Directed, in his own inimitable style, by Alan Payne, the play will be staged on three successive evenings. Available on the door if not sold out – best to book in advance. Immediately following Dangerous Corner, we will hold this year’s Annual General Meeting, to take place at 7.30 pm, at Lewdown Victory Hall, on Tuesday 16th April. An AGM, apart from going through necessary formalities, provides very much an opportunity to breathe fresh life into an organisation and to begin the process of charting the way forward for the coming year. In order for this to be successful, we need you, our members, to come forward, both to give us your ideas and also, we hope, to volunteer both to join the committee and to put forward ideas for future productions and activities. Following the great success of Gill Taylor’s production of Fantastic Mr Fox last year, we are particularly keen to expand our membership among children and young people and to get them involved in future productions. Some tentative future plans were outlined as long ago as in our June 2017 Web, but what we need now is getting things discussed, agreed and under way for the coming year by a new committee. So please come along on the 16th April and have your penny worth, volunteer if you wish and join us in some chat over refreshments. The Wheel of Life, written by Ron Wawman, is based on the later stages of the life of Sabine Baring-Gould. Following an enjoyable read through of the script last summer it is hoped that it will provide a central part of our plans for the coming year. At present, we have been exploring how best we might put on a production in the round at Bratton Clovelly Parish Hall in March 2020. We hope that more details can be given soon. Those with longer memories, will remember Ron’s extremely impressive earlier venture into theatre in the round in Bratton, Like a Buoy. Children and young people, we are always really keen to follow up suggestions from our members and are particularly interested in a future production that will involve children and young people. Summer holiday workshops followed by a production during October half term would be a good time – any ideas?! Red Spider subscriptions for 2019 are now due. They remain remarkably good value at only £6.00 for an adult or £3.00 for children up to 16 years of age, or £10.00 for family membership. Please pay your subscription to Martin Perry (martinperry.northlew@gmail.com). Cheques should be made payable to Red Spider Company (posted to Martin at Elmfield, Station Road, Northlew, Okehampton, Devon EX20 3NP) or if you would prefer to pay by BACS, Martin can provide you with the details of our new Lloyds Bank account. If you would like something included in a future edition of The Web, please drop a line to Amanda (amandakgreen@hotmail.co.uk).